Monk fruit, also known as Lo Han Gu, has a long history of use in traditional eastern medicine for the treatment of inflammation, colds and flu, and other conditions. Monk fruit extract is a natural sweetener that is 200 -300 times sweeter than sugar, yet, it has no calories, no carbs, and no fat. The sweetness is derived from a group of compounds called mogrosides, which are naturally occurring antioxidant compounds. Pure monk fruit extract is a “zero-calorie” sweetener with no carbs or sugars. Due to its nutritional profile, you can find it in coffee, protein beverages, yogurt, and even ice cream. Maintaining healthy blood sugar levels is crucial to supporting vital bodily functions. Most importantly, it reduces the risk of diabetes and heart disease. As a natural sweetener, monk fruit does not affect blood sugar levels because it does not have sugar. As a matter of fact, monk fruit contains compounds, called mogrosides, that may help diabetic complications. (x)To put it another way, mogroside stimulates the pancreas to secrete insulin without the need for increased blood sugar. (x). This may be beneficial to those who are insulin-resistant. Mogrosides are powerful antioxidants that fight free radicals–molecules that invade your cells and lead to signs of disease. They help protect your DNA from damage because of they inhibit oxidative stress. Oxidative stress is caused by pollutants in air and water, alcohol, nicotine, and psychological stress. You can help limit oxidative damage by consuming plenty of foods that contain antioxidants, like monk fruit extract (x, x). Traditional Chinese Medicine considers monk fruit a “cooling” ingredient because it can tame inflammation through the whole body. In the long term, chronic inflammation can lead to degenerative disease. In the short term, it can cause redness, pain and discomfort throughout the body. Monk fruit extract can help you to manage inflammation, whether it’s from a sore throat or overused joints (x). Monk fruit extract can impact inflammation on a genetic level. Moreover, it can help to decrease the expression of genes that promote inflammation, and stimulate stronger expression of the genes that reduce it (x). When a cell becomes too damaged to function properly it goes through a process called apoptosis, which is, essentially a form of cell death. However, when this process does not occur and the damaged cell continues to live it can result in a tumor. One of the compounds found in monk fruit extract mogroside V, is believed to inhibit the growth of cancer cells. (x) Results of a study on mogroside V showed that the compound inhibited the growth of tumors and stimulated the secretion of tumor-suppressing signal molecules in the body (x). In other words, the substances in monk fruit may be the answer to tumor suppression in certain forms of cancer. Monk fruit extract contains a compound called Siraitia grosvenoril, which effectively and naturally fights bacteria. It is especially effective at killing bacteria that grow in the mouth, which can lead to tooth decay or periodontal disease. It’s even effective against candida albicans, the bacterium that causes thrush (x). Monk fruit acts a histamine and may be a suitable treatment for common allergies. Allergy symptoms are triggered by airborne allergens that irritate the sinus lining. They include dust mites, mold, pollen and pet dander. When the body reacts to these particles, it releases histamine which triggers an immune response. Release of this chemical triggers irritation and any other allergy symptoms like sneezing, coughing, or a stuffy nose. Daily intake of monk fruit sweetener could prevent the mast cells from releasing histamine and relieve or significantly reduce allergy symptoms (x). Monk fruit, also known as luo han guo is scientifically classified as Siraitia grosvenorii, has its origins in China. The fruit itself is about the size of a small orange, however, it grows on vines that are 15 feet long. As they ripen they develop a dark green hue that may turn brown. Harvesting practices are done with urgency because when monk fruits are not eaten, dried, or extracted, they begin to rot. The name of the fruit is derived from the Buddhist monks who harvested the crop for distribution to nearby areas. It is now used commercially as a natural sweetener under a few brand names in the US, however, exporting monk fruit is highly restricted. 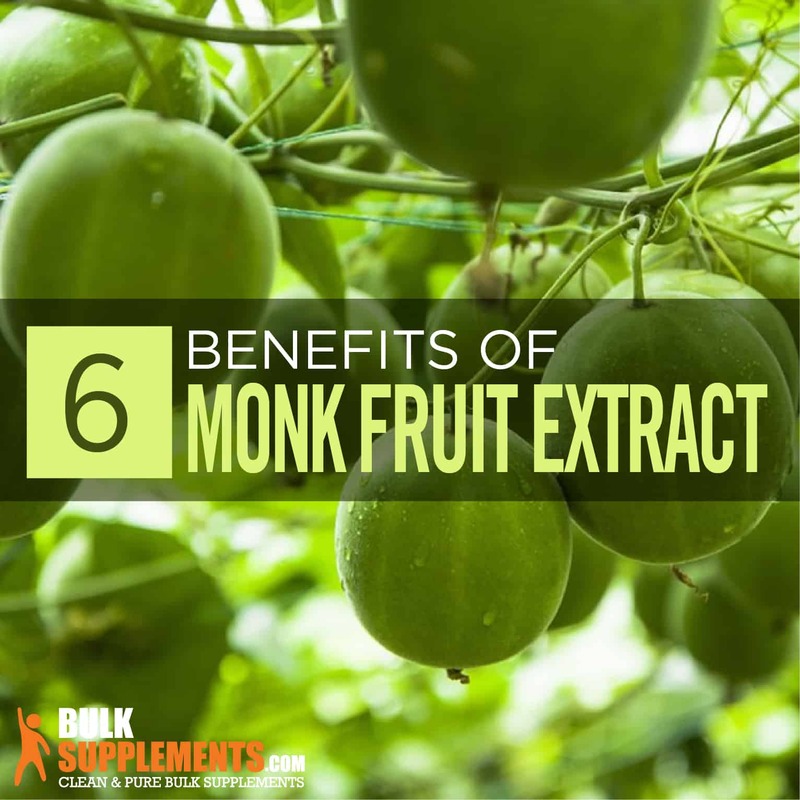 There are no harmful side effects associated with monk fruit extract. The suggested dose of monk fruit extract is about ¾ of a teaspoon daily, which is 2000 mg. Since monk fruit extract is sweet, you can adjust that amount to your taste. You can also take multiple doses per day with no side effects. Start with a small amount first and increase the amount until you find your desired level of sweetness. Enjoying the benefits of monk fruit is as easy as adding this powder to your favorite beverages or desserts. It mixes well in tea, coffee, or smoothies, and it can replace the sugar in many pastries and frozen treats. You can sweeten gelatin, pannacotta, or any other raw dessert with monk fruit extract. In fact, it is an ideal substitute for sugar in recipes that don’t require a lot of sugar for texture in a cold application. Choosing monk fruit extract instead of sugar can help reduce your calorie and carbohydrate consumption. At the same time, it offers antioxidants, is anti-inflammatory, and is beneficial to your overall health. For most people, there are no health risks or dangers of daily consumption of monk fruit extract. In fact, it is a safe option for those with diabetes because it will not increase blood sugars.